 USA  2011  84m   Directed by: Andrew Bellware.  Starring: Robin Kurtz, Walter Barnes, Joe Beuerlein, Greg Oliver Bodine, Nat Cassidy, Lisa Marie Fabrega, Alaina Hammond, Katie Hannigan, Alana Jackler, David Ian Lee, Stacey Raymond, Lucy Rayner, Thomas Rowen..
Robin Kurtz stars as Helen, a woman who wakes up naked in a space station orbiting Earth about being indisposed for the previous 200 years. Having no idea of who see is or what's happening, she spends the remaining movie time trying to get out of the ship while fighting other robots, humans as well as horribly CGI'd monsters. 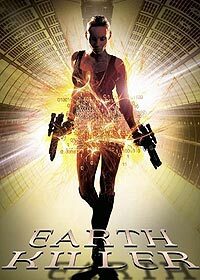 I found this to be an amateurish mish-mash of a handful of sci-fi clichés that wears out its welcome rather quickly. It's no surprise to me in the least that the same person responsible for this travesty was also the one who 'graced' us with 'Battle New York: Day 2' Both of which are available on Streaming Netflix in case you're feeling especially masochistic. Review by movieman_kev from the Internet Movie Database.